I was born a rebel. One of the strongest urges I feel all the time is to rebel. If I wanted to overcome that urge, and I don’t very often, I would have to either speak very sternly to myself, get angry, or just surrender to being normal like everyone else. Three not very nice choices. So usually I just rebel. Gentle Reader, I wish I could tell you I was proud of this. But I’m not; it’s just how it is round here. One of the expressions I use to explain how it feels to be me in this regard is that I never knew I wanted to walk on your grass until I saw the sign telling me that I couldn’t. Grass should so patently be walked on. Or sat on. What else is grass for? Looking at? Oh, for heaven’s sake. This so smacks of petty bureaucracy, the sort which tells you what you can and cannot do in swimming pools for instance, and put up annoying signs the whole world over, most of which are to protect us from our own stupidity, and some of which do not make any sense at all. Ooh, I feel a rant coming on. So I was so delighted when I read about this woman last week. The Duchess of Northumberland sounds 100% glorious. 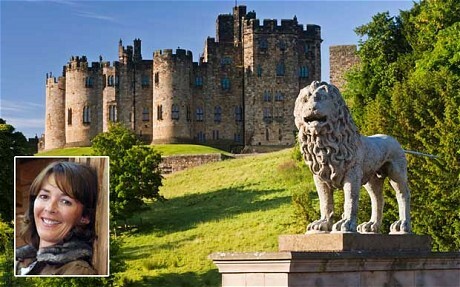 At her home in Alnwick Castle she has created gardens where the public are encouraged to pick the wild strawberries and walk on the grass. She’s experimental, she has a poison garden and is introducing cage-fighting. Say what? Read the full story here. And hooray for the occasional, barking mad, upper class British eccentric. How refreshing!